They wanted me to cut a version of Bill Monroe's "Blue Moon of Kentucky" for the sound track to Coal Miner's Daughter, and I had to swallow hard on that one and ask the producer how he'd like to follow the Blue Grass Boys and Elvis Presley. But I went into the studio with the Cate Brothers and Fred Carter Jr., and after we did "Blue Moon", we figured why not put a little more hay in the barn, so we cut twenty more tracks. Around the time Coal Miner's Daughter came out in 1980, MCA (who had gobbled up ABC) released ten of these under the title American Son. Given the natural Appalachian twang in his voice, it only made sense that Levon should contribute a song to the Coal Miner's Daughter soundtrack. Thus it was that he found himself in Nashville's legendary Bradley Barn studios cutting a superb version of "Blue Moon of Kentucky". 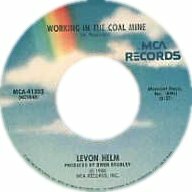 A Levon Helm 45 single was also released after these recording sessions, as MCA Records MCA-41202. The A-side was "Blue Moon of Kentucky", on the B-side was Levon Helm's version of Allen Toussaint's classic "Working In The Coal Mine". 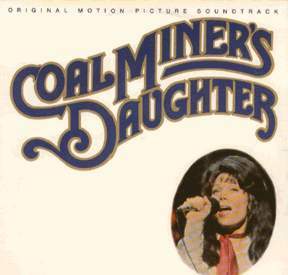 Coal Miner's Daughter was re-released on CD in the spring of 2000. There's an entry for the film in the Internet Movie Database.